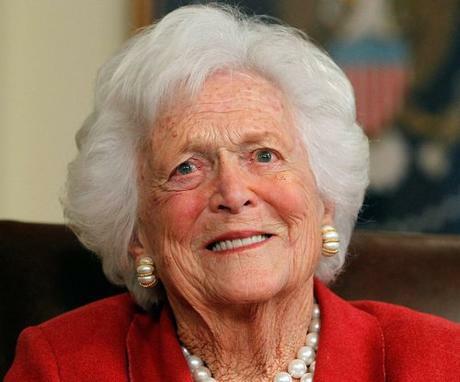 Former First Lady Barbara Bush, health is failing, and has decided to end medical treatment for a life-threatening illness. The family matriarch, who is 92 years old, has been suffering for some time and has been in and out of the hospital multiple times in the last year, while battling with Chronic Obstructive Pulmonary Disease, or COPD, and congestive heart failure, according to CNN. According to multiple reports Sunday afternoon, Mrs. Bush is being cared for at her home in Houston and has decided she does not want to go back into the hospital. Family spokesman Jim McGrath announced on Twitter Sunday that the former First Lady, made the decision after consulting with her family and friends. “It will not surprise those who know her that Barbara Bush has been a rock in the face off her failing health, worrying not for herself — thanks to her abiding faith — but for others,” he said. Her husband, George H.W. Bush, the nation’s 41st president, is now 93 years old and struggling with a Parkinson’s-like disease that has confined him to a wheelchair and made it difficult for him to speak.